Do you have a history lover in your home? How about a kiddo who loves audio dramas? Me? I have both. Actually, I have several kids who love both. Enter, In Freedom's Cause Single Package, a historical audio drama produced by Heirloom Audio Productions. Yes, we were blessed by the second release from this God centered company, our first being Under Drake's Flag, which we had the pleasure of reviewing last year. With over 2 hours of exciting adventure, In Freedom's Cause will have you sitting on the edge of your seat and sometimes holding your breath! As one of the producers says, "This is the God story behind Braveheart." Based on G.A. 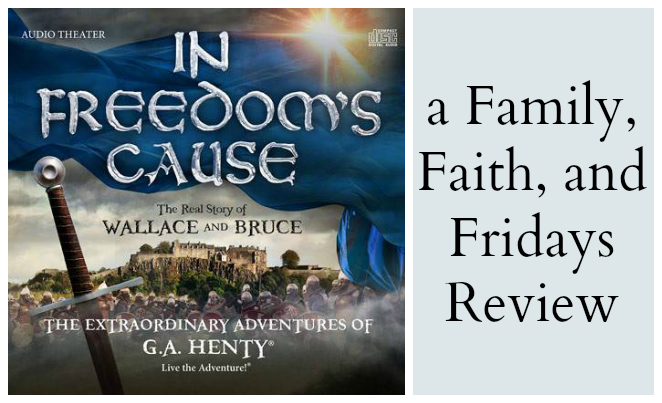 Henty's book by the same name, the true story of William Wallace and Robert the Bruce is told with riveting accuracy! It is a story about how an ordinary man, but one of intense faith, changed the course of Scottish history. It is a tale that will inspire and enthrall you and your children. While the recommenced age is from 6 to adult, I firmly believe that this is a family friendly production. However there are some pretty intense scenes, so if you have a sensitive child, you may want to preview it first. Many will recognize the vocal talents of favorites in the film industry such as Joanna Froggatt from Downton Abby, Billy Boyd from Lord of the Rings, Skandar Keynes from Chronicles of Narnia and James Cosmo from Braveheart. These CDs are top quality! They bring history to life and make learning fun. They tell the story from a Christian perspective. They are just good, clean entertainment. 34 weeks of Clean! Week 9- Books! It may have been the packer telling me that all of our weight was in the books. Luckily for him I did not take it personally. But my husband took it seriously and we have since scaled down. It was hard and my oldest even blogged about it. However, since then, someone (probably me) has bought a few more books. Plus, read- this is my excuse, I review a lot of books so they sneak their way into my house. Add that to the fact that when we moved we had to scale back and move out two bookcases. 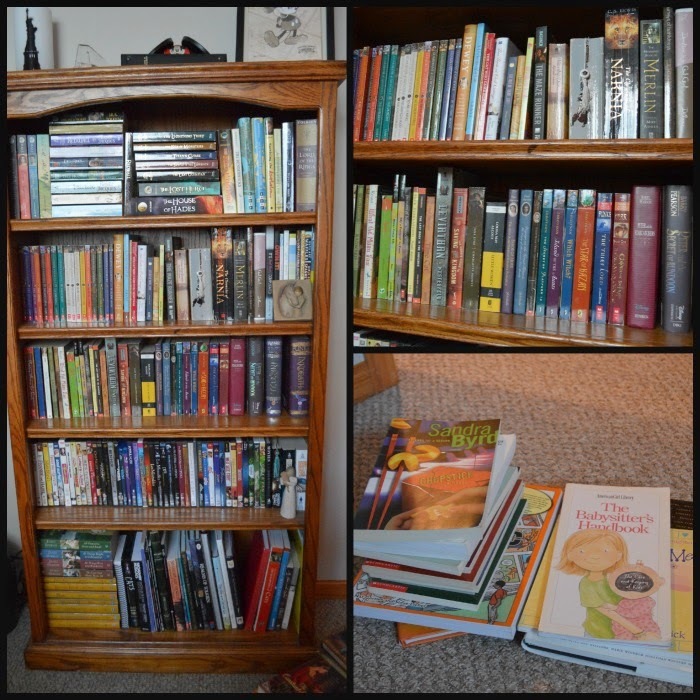 Less space, fewer books. I know, I know - boo hiss. But here is the deal. Books take up space. Books not being read collect dust. Books cost money. Libraries are full of beautiful books. I can read them without owning them. I can also store more on other devices taking up less space. So this week's goal - Organize your books throughout the house, get rid of those you do not love and decide which ones you MUST keep, and clean off those bookshelves. In every room they reside in your house! Take all of the books off the bookshelf. Sometimes once you actually lay your hands on them, you will decide you really don't need that particular one. If you are a little OCD like me, you can categorize your books! ;) If I am looking for a certain book I can usually locate it pretty quickly. Except for that one series I cannot seem to find on ANY of our bookcases. I am praying they will show up the next time we move. Only keep what you LOVE! If you just enjoyed it, pass it on and let someone else have a turn enjoying it. Hospitals, nursing homes, and health clinics welcome donations. Even some hotels will accept book donations to have for their guests. Just a few of the books we took off our shelves to move out! Use a hair dryer to dust off the pages of books that have been sitting for a while. Even our allergists warned us that books are a collector of all things dusty. Old books can even be set outside on a warm, sunny day to air out. Dust the bookshelf, top to bottom and even the outside. Think spring cleaning here, not just your weekly fly-by dusting! Got another bookshelf? Or two? Or more? Find the next one and start the process over again! Psst- homeschoolers- hold off on THOSE books! ;) But, yes, even go through the books in your children's rooms. If you head to more than several rooms with this project, be careful not to get distracted. Stick to books only this week. Promise?! For those of you who love to lend out books, sometimes never to see then again, Kemi from Homemaking Organized has created some beautiful book plates for you to add to your books! They would also make a great gift to print out and give to a friend! Ok, get to work...I am off to read a book. Before you leave, let us hear how you are doing taking back YOUR house and feel free to add your posts to the linky! We love seeing other's progress! Happy Home Day Colby! 6 years ago today we were blessed to bring this little man home. Every day is an adventure! 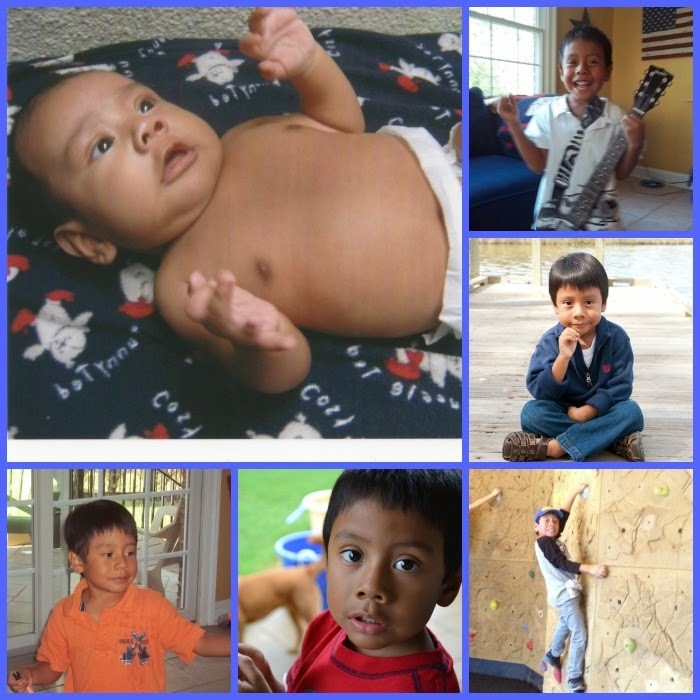 We are so very thankful to God, his foster mom who raised him for the first 21 months of his life, and to CJ's birth mom for choosing life and allowing us to make him a part of our family. 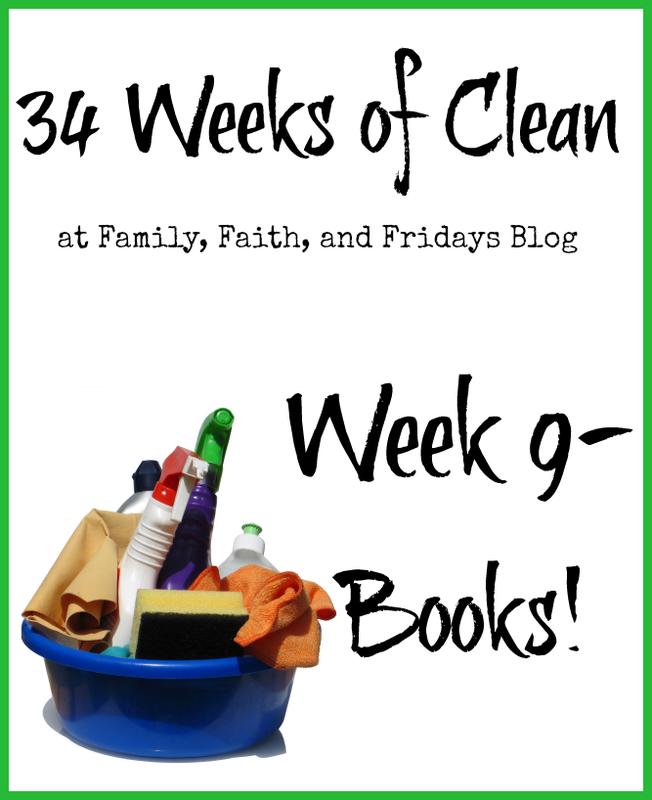 The reason this blog first began was so that I could review homeschool materials. Yes, I am a homeschooling mom. And yes, I love curriculum. Actually, the truth is I love anything that benefits, blesses, and supports families. Homeschoolers or not! Because I try hard to keep my finger on the pulse of families and family related products, I had heard of IndoctriNation (produced by Great Commission Films) a while back, but just had not gotten a chance to see it. This past month I was blessed with the opportunity to receive and watch the DVD of IndoctriNation. I am not sure exactly what I expected, but I sure got that and more! IndoctriNation is the brainchild of film producer and homeshool father, Colin Gunn. Scottish born Colin boards a "big, yellow bus" along with his wife and children to travel to various parts of the United States in an effort to research "public schools and the decline of Christianity in America." He interviews big names such as R.C. Sproul, Voddie Baucham, Israel Wayne, and Ken Ham, as well as a public school graduate, principles, teachers, and various leaders in government. The film is also sprinkled with quotes from authors, historians, and men of the faith. By examining where the public school concept actually came from, (you might be surprised!) Colin seeks to answer the question, can the system be fixed or do we abandon it altogether? He covers the areas of sexual sin, violence, abortion, drugs and alcohol, and the governments involvement in the classroom. This 102 minute DVD is for adults, mainly Christian parents, and again, does talk about sensitive issues such as abortion, homosexual relationships, drugs, violence, and alcohol. I watched it by myself the first time and then with my older children the second time. This gave me time to gather my thoughts first, and then allow us to discuss what we saw, heard and learned together after they had watched the movie. Yes, it contains some pretty hefty subjects, but IndoctriNation provides a good starting point for some serious family discussions, that while we may not want to have, we must if we are going to send our kids out equipped and ready to face a secular world that is often anti- Christian! Wow. This DVD rocked my world. I was surprised by facts and percentages. I was surprised by the quotes. I was surprised at my misconceptions. I was surprised at how saddened I was by what I heard. This movie truly does not come off as an attack on public schools. It is not a hate film or some paranoid society propaganda. It simply is a presentation of the facts and opinions of many people out there - even everyday people like you and me. It explores the reasons that over 70% of people say that public schools are not good, but think that their child's school is somehow the one that is different. Or that people argue that Christian kids need to be salt and light in schools and yet if those same kids (or teachers for that matter) mention the name Jesus, they will be kicked out. "Is there anything more radical in the history of the human race than turning your children over to total strangers who you know nothing about about and having that stranger work on your child's mind out of your sight for a period of 12 years?" Yep, speaks truth to me! I will have to say that one of the most compelling parts of the movie for me came near the end with the interview of a father of one of the students who was killed in the Columbine school shooting. As he recounted the last conversation he had with his son, how he heard about the shootings, and how he learned of his son's death, I was moved to tears. One of his comments was, "I'm the one who put him there. And I am the one responsible for his death." Heartbreaking for anyone to hear. Eye opening as well. We are all parents who love our kids. Who want them to be safe. Who want them to get a good education. IndoctriNation compels you to look at all of the facts and make an informed decision. Not by the world's standards, but by God's. I would encourage you to do the same. 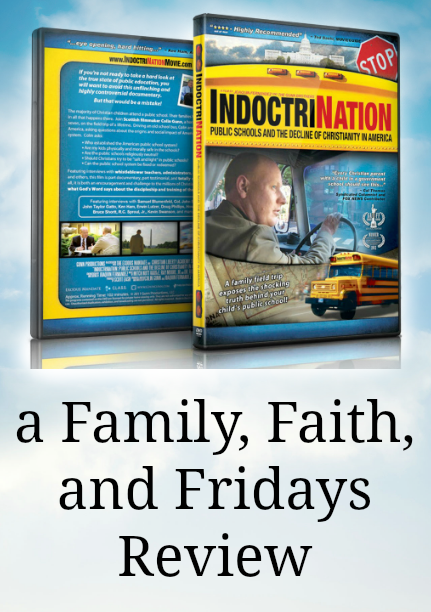 You can purchase IndoctriNation DVD for $19.95. 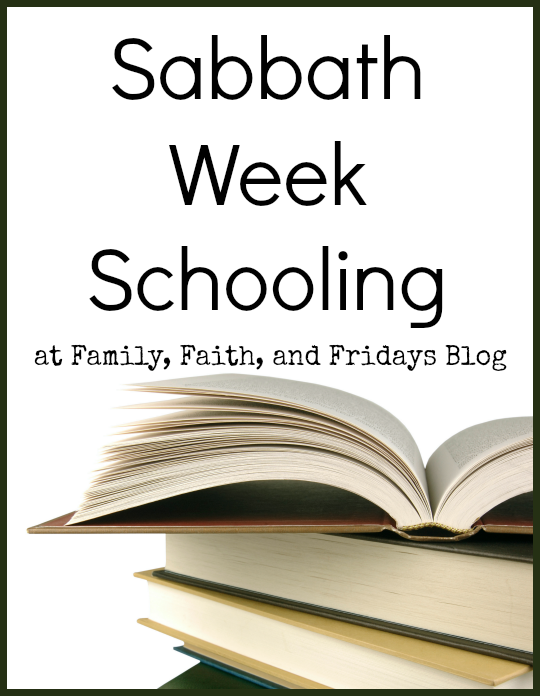 Did you know that every homeschool schedule looks different? Really. There are no right or wrong ways to homeschool as long as you are following the laws of the particular state you reside in. I know people who unschool, those who school classically, and some that love unit studies. I know families that love textbooks and some that have never cracked open a textbook in their lives. And believe it or not, we have done a little of all of that to some degree through the years. When you have been homeschooling for over 16 years, you tend to change and morph what your schooling looks like. Add to the fact that you have 4 kids with different learning styles and personalities and yes, we have changed our ways more than several times. This year is another example of that! What I found was that there were no clear rules for Sabbath Week Schooling, but a lot of ideas and thoughts. The basic was this - school for 6 weeks at a time and then take the 7th week off. Repeat. Quite honestly, I am not really sure I could have told you what made me decide to try it initially, but due to our current situation I now know it was a gentle nudge from God! We needed this schedule at this time in our journey and I am happy to say that God's plans are best! For several years we schooled based on my college student's schedule. When she was on break, we were on break. It worked. But since we were no longer tied to that kind of schedule, I was free to try something new. Because I knew that I wanted to have the week of Thanksgiving off, I actually started my schedule there and counted backwards to determine when we would "start" our new year. Keep in mind, we tend to school year round but we do use a lighter schedule in the summer and begin a new grade in the fall. We began August 25th, schooled for 6 weeks, took a week off and began again. The only hiccup we found was that once we got to December we only schooled 3 weeks before I wanted to take a break. No biggie. We took a few weeks off and then started again with week one in January. It gives us a time for rest. It gives the kids something to look forward to. Yes, they can tell you what week we are on. It gives me time to lesson plan and re-evaluate our school plans. It gives us a free week to schedule outside appointments, (think dentist, haircuts, oil changes in the car, doctor appointments, etc.) and keeps us at home more during school time. It gives me a week to concentrate on the house and other projects that are harder to get to during schooldays. It gives us time for play! Like this past week when I took the kids out of town for the night to shop, eat out, play in a pool, and sleep in a hotel. Just a simple 24 hours, but one that gave us a break in the normal action, allowed us some quiet family time, and rejuvenated us to begin again today with school! No matter how you decide to school, I would encourage you to take a break from your schedule occasionally and just enjoy family time. 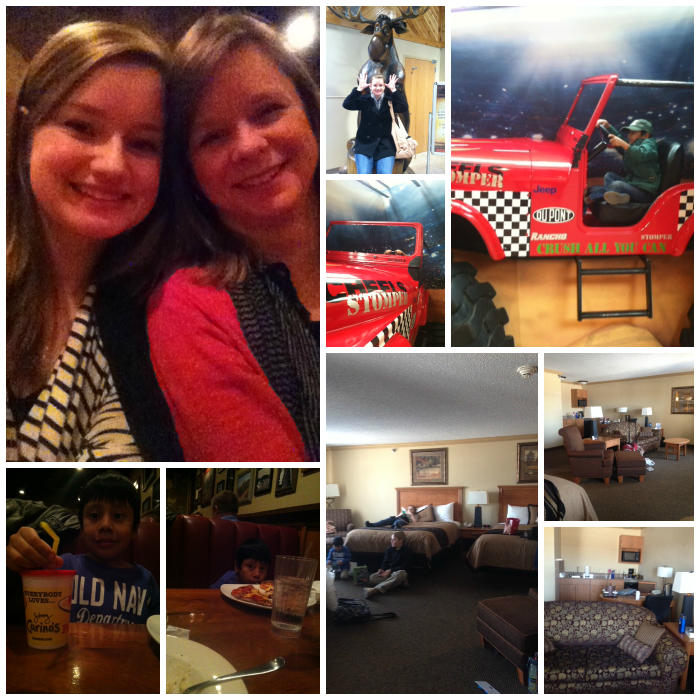 One of the reasons I love homeschooling is that we can spend time together as a family for extended periods of time. Making sure we do that outside of "schooltime" is important as well! So this week - the living room. The more formal one, that is. Family rooms/dens are for another week, so some of you may actually have a week off. Or can use this time to catch up if you need to. We won't judge! Wax/dust furniture. Not just the top like I assume most of us do weekly, but ALL OVER! We actually used a furniture cleaner as opposed to a wax or dusting spray to get the job done. Wipe down all of the knick nacks you have on said furniture and put only half back! ;) Now is the time to get rid of the things that are just taking up space. Look at it this way, the more you have sitting out, the more you have to dust each week. If you have leather furniture, now is a great time to really wipe it down. We love ours, but just like other non fabric surfaces, little fingers get it dirty. If you have cloth furniture, vacuum it. Wash blankets and any throws you have laying around. You can even take this time to switch one out for one in another part of the house. Sometimes just a simple change can make you feel better about your space. Pull the furniture out from the walls and wipe down all the baseboards. As as long as all the furniture is out from the walls, rearrange. Oh, wait, that may be just be me! ;) Remember, this family moves a lot. Emphasis on A LOT! So when we get to stay in one place say, for more than a year, we tend to get antsy and rearrange furniture. 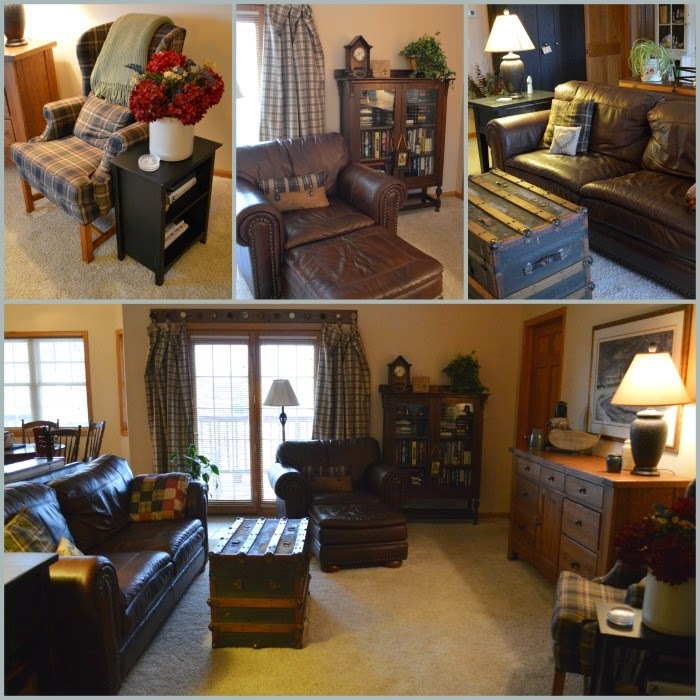 True story - when my oldest was about five and daddy was gone for a few months, I rearranged the living room. She stood in the middle of the room crying, "put it back, put it back, daddy won't like it!" Don't ask how she reacted when I painted! Luckily, she is now the Queen of Rearranging and I am happy to say did not cry once during this project! 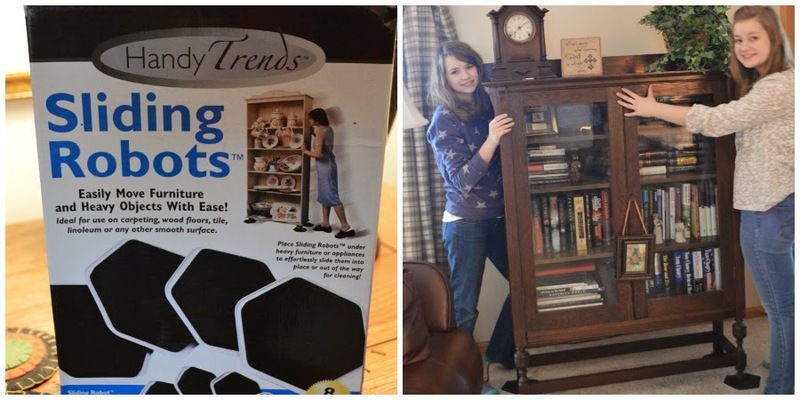 If you move furniture around a lot, you need these Sliding Robot things! We love them! On to windows. UGH! Can I just admit right now I LOATHE mini blinds? YUCK YUCK YUCK. They may serve a purpose but they get so dirty. We are in a rental and I am pretty sure that these have never been cleaned. To prove my point I am going to show you the cleaning cloths - do not judge. I am pretty sure that this was not good for my daughter who is allergic to everything environmental. Some day I am going to NOT have blinds, only curtains. -Two quick tricks- if it is easy to do, just take the blinds down, stick them in the bath tub, and bribe pay your kids to scrub them! Tell them it is like pool fun, but better. - If you are too lazy to do that, just spray them down while still hanging, start from the top and scrub away. I do this and it usually works just fine for me. Make sure that after you finish the blinds you raise them and clean the windows since they will now be gross, too! Ask me how I know this! And about those curtains. When is the last time yours were washed? Fess up! We have very few hanging for two reasons. The biggest is because I refuse to buy curtains to fit every window of every house we live in. The second is because as much as I like the look, they do collect dust and are not the best for our oldest and her allergies. Anywho- if you have them, take them down and wash them. You may even decide to leave them down for the season and let the light shine in! Lastly, give the room a good vacuum. Now is an even better time to steam clean your carpets! We own a steam cleaner attachment for our vacuum, but if you do not see if you can borrow one from a friend or rent one- many grocery stores even do this now. Cleaning carpets twice a year is a good habit to get into and can extend the life of your carpets! If you have wood floors, sweep and mop. Are you tired yet? I am! As you can see, I had two helpers and this was not a quick project. But as I sit here typing a recap I can look around and smile- it looks tidy, smells clean, and says WELCOME! 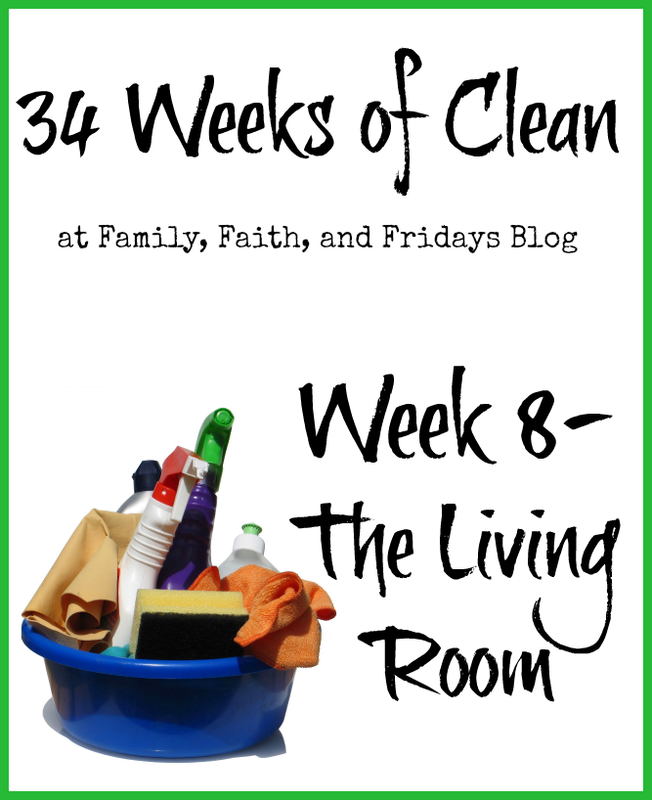 And despite the fact that I almost messed her up and got a week ahead of her, Kemi from Homemaking Organized has a sweet printable for you to spruce up your living room. Have I mentioned how great she is? Hop on over and print it out, and tell her how talented she is! Your turn to work on those Living Rooms! Can't wait to see what you do. In the meantime, how about linking up those dining rooms or leaving us a comment of how you did! Until the next assignment, HAPPY CLEANING and many blessings! This is what school looks like when we are on a Sabbath Week School Break! (see, I told you I schooled other kiddos) Details coming on Monday! Linking up with some friends! 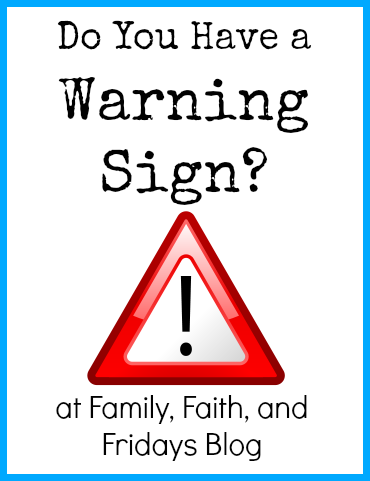 Do You Have a Warning Sign? In our Sunday School class we usually open up with a quick discussion question and then go around the room and each person answers it. A few weeks ago the question was "If you came with a warning sign, what would it say?" My mind immediately started processing and a million ideas flashed through my head, OK maybe not a million, but some doozies. Mad military mom. Don't mess with me. That would be for the banking lady who got snippity with me on the phone a few weeks ago. Unhappy Home Tenant. That is because I keep having water heater problems, an air vent that leaks water, and a door that lets in cold air. Homeschooling mom and no, it is not summer yet! That is because February is the month to grow weary of school, homeschoolers and public schoolers alike, right?! Beware of random tears! That is because deployment is a hard and lonely journey. 'nuff said! To be honest I do not remember what I even responded. My kids might remember. But later in the day that question kept coming back to me. What I wanted to say was not what I said, I know that much. Contents under pressure. Yep, right now that would be my warning sign. Pressure to "do" this deployment right. Pressure to take care of my responsibilities and now my husband's as well. Pressure to raise the kids right, alone. Pressure to set a good example. Pressure to live up to everyone's expectations. Pressure to... on and on and on. Some days it is enough to make me feel like it is all going to blow up in my face. Those are the days that I have to remind myself that I will succumb to those pressures if I try to do this alone. I KNOW that is not possible and that I am not able. The good news is that God is. I cannot handle all of the pressure, but He can. Even when I cannot see the light at the end of the tunnel, it is there. HE is there! Because, quite frankly, what else can we do? Matthew 11:28 says "Come to me , all you who are weary and burdened, and I will give you rest." I pray that if you too are feeling burdened, pressured and weary, that you cling to Jesus. He WILL give us rest. He is able when we are not. OK, I am going to just jump in feet first and say it- I am so excited about this week's challenge. Why, you ask? One, we are DONE with the kitchen. And two, because I do not currently have a dining room. We have had many in the past but short of being just another place to hold extra stuff, they are not a good fit for our family so I am ok with our lack of one. Dining rooms tend to be areas that only get used a few times a year and otherwise go unnoticed. Or gets turned into a school room, but that's another post! BUT, lest you think I got out of this week's challenge entirely, let me put your mind to rest. I may not have a formal dining room in this house but I do have two additional storage pieces that "should" be housed in a dining room-type space. When one moves frequently and lives in a variety of types of homes, one gets a little creative and has to think outside the box. Actually, I am not particularly good at that, but luckily I have a few friends that are. So, let me show you a few of their creative solutions to my lack of a dining room while we tackle some clutter and clean those spaces. 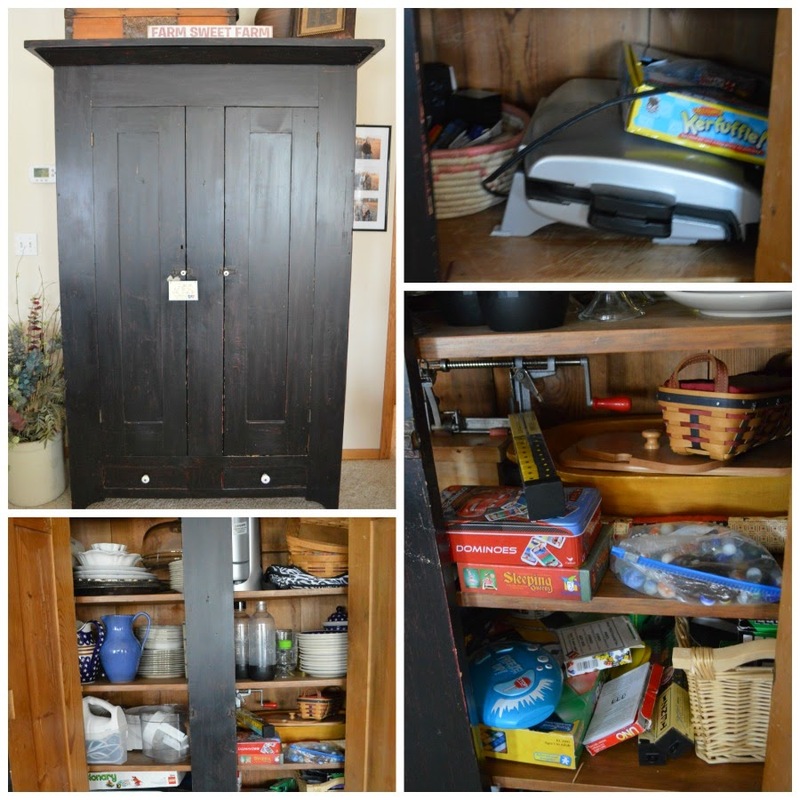 Open up those buffets and such and declutter! Start by taking it all out, purge what you do not need and then put it back, neatly please. Games got moved to the bottom two shelves, dishes on one and appliances on another. Special serving dishes are on the top shelf. -If you have small appliances that do not get used daily, consider keeping then somewhere other than right in the kitchen. Our ice cream maker, blender, and George Foreman do get used frequently but not daily. They are close enough to be easy to reach but do not take up limited kitchen cabinet space. Again, you may need to think outside the box. -So here's the deal, grandma's china may be lovely but if it does not get used it is just taking up space. If you use it, keep it. If not, give it to someone who will. - At one point in my life I thought it was a great idea to register for 12 wine glasses and 12 champagne glasses, along with 12 of a lot of other things I did not need or use. Eventually I gave our movers a break and passed them on (you are welcome!). Yes, they were pretty, no they were not necessary. My second piece of furniture, our "buffet," is now in our living room. And no it is not a buffet. It is actually my oldest's dresser but since it does not currently fit in her room, we have taken the mirror off of it and placed it in the living room to pretend it is a buffet. Inside of it are things like placemats, tablecloths, and more china. -Yes, you CAN have too many tablecloths and placemats. Ask me how I know. I now have a few less. Grandma's old "antique" one was lovely, but, with a few holes in it, I was not going to use it. Sensibility trumped sentimentality. I think she would understand. -If you entertain and can justify owning glass plates and a punchbowl, by all means keep them. I will. But if not, most churches have sets like that and are usually more than happy to let you borrow theirs. Again, make decisions that are right for you and then be happy with those decisions. Now that those furniture pieces are straight, time to make them shine! Clean top to bottom. Now is also the time to deep clean your table and chairs. If you have one in the kitchen, sorry, but go back and hit it, too. Not just the top, but the legs and all. Chairs too! Just think about how many dirty hands touch the rungs and sides of chairs. Ok, don't think about it- just scrub! Castille soap and water are great for this job! Other areas to clean- mini blinds (did I tell you I loathe mini blinds? ), windows, curtains, chair rails, light switches, and chandeliers. This is the time to get it all. Last area, the floor. Just like in the kitchen, work your way around the baseboards and then on to the floor. Tired yet? Trust me, this is probably not going to be a one-day job for most of you. It took me two days even without a formal dining room. If you do not have a dining room at all, then make that kitchen table sparkle and reward yourself with a treat. Chocolate works great! And now for this week's printable from Kemi at Homemaking Organized- two table setting guides, one casual and one more formal. This a great reminder for those of you who have been eating in the living room a little too long or to print out for your kids so they can learn to set the table for you! ;) Thanks Kemi! One month down of challenges down! How are you doing? It is time to link up and show us your clean ovens and finished kitchens! I can't wait to see what you gotten done. A special thank you to all who are participating with us. Whether you are linking up, leaving pictures on our Facebook page, or just participating in the privacy of your home, we are thrilled you are with us. This series started off as a way for our family to get motivated to take our house to a new level, but since then it has provided so much more - laughter, comradery, and new friendships most of all. I thank you! 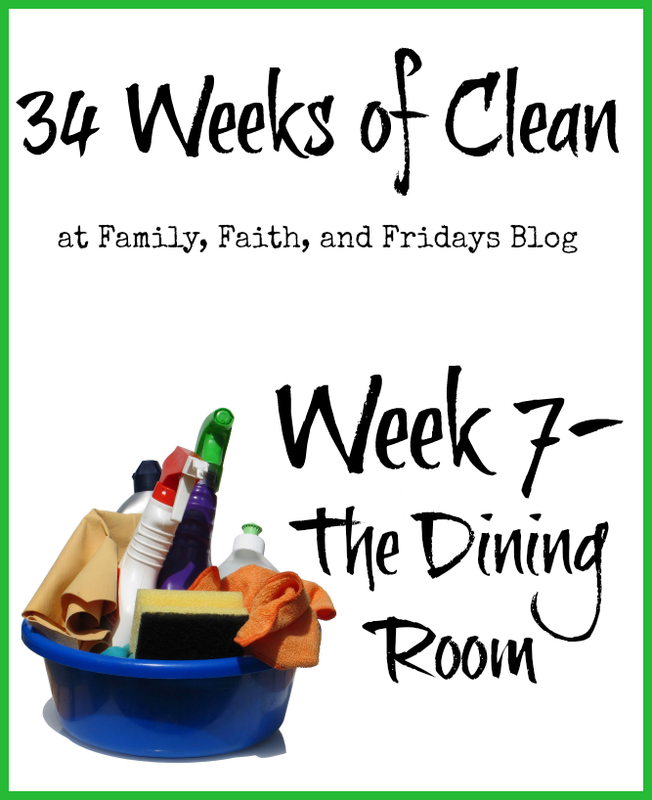 Until next week, blessings and happy cleaning!